ENGL480 – Asian Canadian and/or Asian Transnational Studies examines a selection of literature and film that addresses the complexities of transnational movement across the Pacific. Students will read texts that come from both East Asian (i.e. Chinese, Japanese, Korean) and South Asian (i.e. Indian, Pakistani) diasporas, and consider how various writers respond to and rewrite dominant representations of Asia in mainstream cultures. Such representations include widely circulated racial stereotypes such as enemy alien and model minority, as well as the longstanding perception and exploitation of Asians as a source of cheap and expendable labour. Students will also consider how issues such as language and translation, geographic location, culture and identity, and gender and sexuality shape the ways in which diasporic texts are read and the social labour they perform. Required readings in theories of diaspora, transnationalism, and cultural identities will provide conceptual frameworks for situating and analyzing the primary works of literature and film. Students will be encouraged to engage with locally-based diasporic communities as well as their histories of cultural activism through visits to community sites, archives, and (when possible) through classroom conversations with visiting writers and activists. In the 2016 iteration of this course, ACAM faculty Dr. Glenn Deer invited his students to consider the complexity of Asian diasporic cultural production through the lens of diasporic foodways. Students were encouraged to explore food in literature, cookbooks, and films across different cultures and borders in North America, with a particular focus on Vancouver and wider Vancouver suburban contexts. To facilitate conversations around the creative possibility of the intersections between writing, filmmaking, and food, the course also featured class visits from award-winning filmmaker Cheuk Kwan and cinematographer Kwoi Gin; Janice Wong, author of Chow: From China to Canada: Memories of Food + Family; and some of the contributors to Eating Stories. Moreover, as part of ACAM’s larger efforts in community collaboration and outreach, a selection of student video projects were shown in Richmond Museum’s exhibition entitled Our Journey Here: Telling Stories About Food, Cooking, and Eating in Richmond, BC in July 2017. 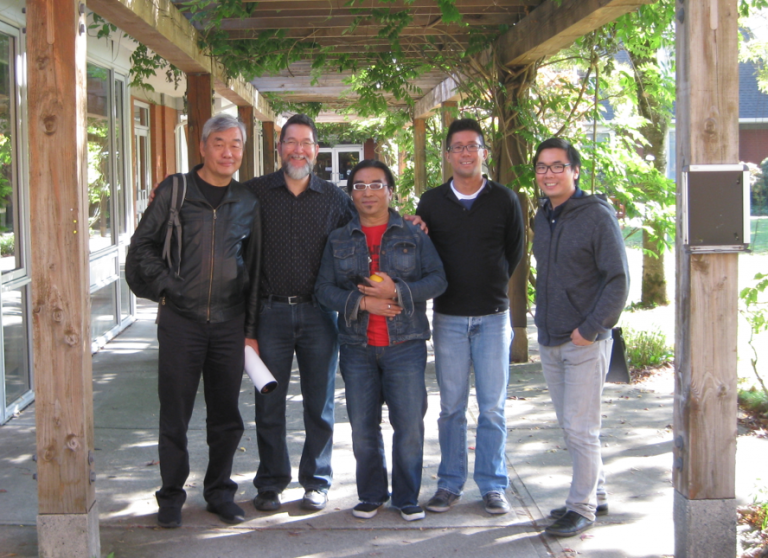 From left to right: filmmaker Cheuk Kwan, class instructor Glenn Deer, cinematographer Kwoi Gin, ACAM director Chris Lee, and UBC Liaison Librarian Allan Cho.